Frederick Barbarossa was born in 1122 in the monastery Weingarten. He was the son of Guelph Judith. Frederick had a cousin, called "Henry the Lion", who was his greatest enemy. In the year 1152, Frederick Barbarossa was crowned King of Germany. Today people know Frederick Barbarossa as a powerful soldier, who tried to conquer Jerusalem and return it to the Christians. He was born in 1122 in a monastery in Altdorf, which is now called Weingarten. During the Middle Ages, most women returned to their birth country, so it is very likely that Frederick’s mother had been born in Altdorf, too. Frederick's nickname was Barbarossa (“Redbeard”). This was because of his remarkable beard, which was red. “Barba” is the Latin word for beard. “Rossa” is also Latin and means “red”. Frederick was raised formally and strictly. On 4 March 1142, at the age of 20, Frederick was crowned King of Germany. His cousin, Henry the Lion, was Frederick’s enemy for many years. Henry wanted to become King of Germany, too and therefore was angry when he found out that Barbarossa was to be king and also Emperor of the Holy Roman Empire. In 1156, he married Lady Beatrix. They had many children. Frederick participated in the third crusade. He never actually reached Jerusalem. It is said that he drowned in the River Saleph in 1190. His soldiers carried his dead body to Jerusalem and buried him there. 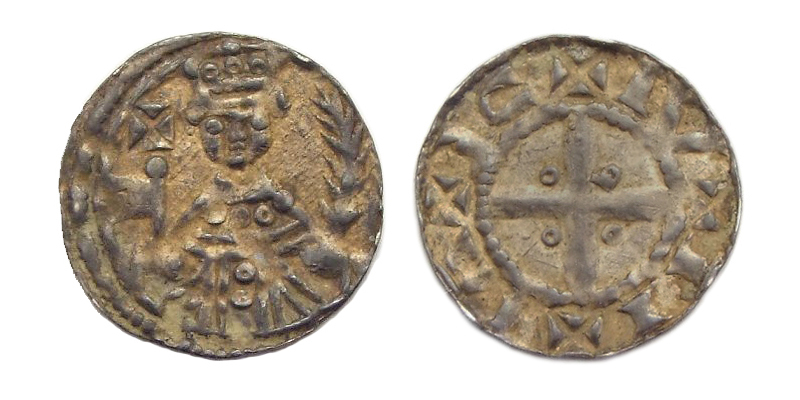 Penny or denier with Emperor Frederick I Barbarossa, struck in Nijmegen. Frederick Barbarossa as a crusader, miniature from a copy of the Historia Hierosolymitana, 1188. Frederick I, Holy Roman Emperor Facts for Kids. Kiddle Encyclopedia.